See and be seen with Cyclelite from Touch Of ECO. 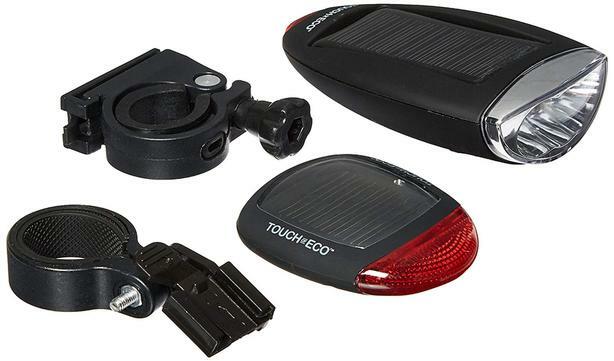 This two piece solar bike light combination set features both a solar headlight and solar taillight that is perfect for any biker. Never worry about being seen at night or only being able to bike during the day! Each unit features multiple ultra-bright LED bulbs with low-profile mounting hardware for quick and easy installation. The rear light even features three different settings including a rapid flash, slow flash, and steady light. Both of Cycleite's solar panels only need to receive just over two hours of sunlight in order to produce over four hours of steady light. Better yet, the front light features three ultra-bright white LED's that produce a brilliant 20-lumen beam. The backlight has two red LEDs that help motorists to see you from a distance. Steady, flash and random modes let you choose the best setting for the conditions. Flexible mounting design adapts to virtually any bike. You can even adjust the angle of the solar panel on your bike so that your panel charges while you ride! The mounting clips also come with additional grip tape ensuring your light will not move or slide while you peddle. This is a must have for bikers of all ages and levels!